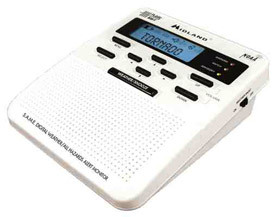 Here in Mobile we finally broke down and bought a weather alert radio. It woke us up this morning. With hurricanes during the summer and severe thunderstorms at other times of the year, people pay attention to weather here along the Gulf Coast. The local CBS TV affiliate, WKRG, has a good weather crew, and they frequently recommend owning a weather alert radio. So we purchased a Midland WR-100 model. The radio receives several frequencies used by the National Weather Service to broadcast warnings and the weather in general. If there is an alert and you have the radio on, an alarm goes off. We did not have to wait even 24 hours after purchasing the radio to see if it worked properly. We turned it on last night, and this morning at 4:45 a.m. we were awakened by an alarm similar to an alarm clock. It was the weather radio, alerting us to a severe thunderstorm warning issued by the National Weather Service. Well, 4:45 a.m. wasn’t my idea of when to get up this morning, but being battery-powered, the radio will be a valuable asset during bad weather, especially during hurricane season.